Christian Bunda used a drone to create this magnificent video of the highest mountain on the Balkan Peninsula. Its peak stands 2.9k meters (about 9.6k ft), making it the tallest mountain between the Alps and the Caucasus. It's located in the southwestern part of Bulgaria, in the Rila National park. As you'll see in the video, the top of the mountain affords a spectacular peak of Bulgaria's other mountain ranges, which collectively cover much of the Southeast European country. 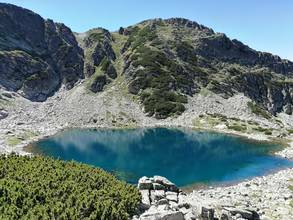 Description: Varful Musala 2925 m, Muntii Rila , Bulgaria.